When it's time to gather creative ideas, organizing a brainstorming session is often the answer. A meeting with your customers or colleagues is a good way of trying to generate as many new ideas as possible. Whilst there are many different types of brainstorming session, they all have the same prerequisite: to achieve the desired result. The most creative and unique ideas often come to mind during a brainstorming session. Once ideas start flowing, more will come naturally, prompting further suggestions from other participants. That's why it is important for all ideas to be recorded during a brainstorming session, ideally in a way that everyone can see them. Legamaster offers useful tools for effective brainstorming including workshop boards, carry bags and accessories for creating a brainstorming environment. 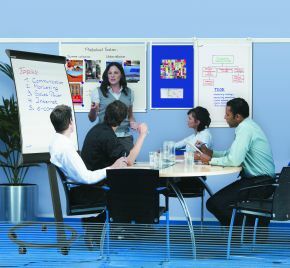 For example, the versatile Multiboard gives you a whiteboard, pinboard and flipchart in one. It also provides a great mobile solution for brainstorming because you can set it up and take it down with real ease – it also has a handy carry bag. Do you hold a lot of extensive, professional brainstorming sessions? Legamaster has put together a special workshop case containing useful accessories such as symbol cards, rectangles and circles, presentation markers, round-head pins and adhesive dots. So you can be sure of having everything you need to hand! Want to find out more about brainstorming using Legamaster products? Discover our wide range under ‘Products’ and find the brainstorming products that you've been looking for. Got a question or need specific advice? Please contact us. We will be happy to help you choose the brainstorming products that are right for you!